KNITTED DRESS WITH POMPOMS + PLAIN LEGGINGS | Catimini Canada - Kidz Global Apparel Ltd.
A fancy knit set for the very little ones, where unicorns have fun under a shower of colourful fur pompoms. A dress in materials with a plain top with coloured fur pompoms stitched on the front and magic frog patch. 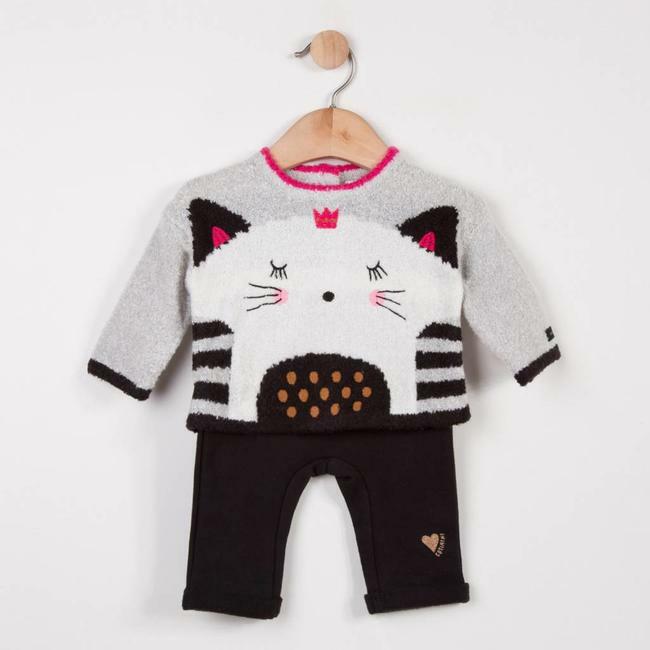 Waist highlighted by a sparkling bias s Read more..
A fancy knit set for the very little ones, where unicorns have fun under a shower of colourful fur pompoms. A dress in materials with a plain top with coloured fur pompoms stitched on the front and magic frog patch. Waist highlighted by a sparkling bias strip over an embossed jersey skirt printed with tiny unicorns. Press studs all the way down the back for easy dressing + Leggings in plain midnight blue stretch jersey. Flat elasticated waist. Catimini signature at the bottom of the leg.